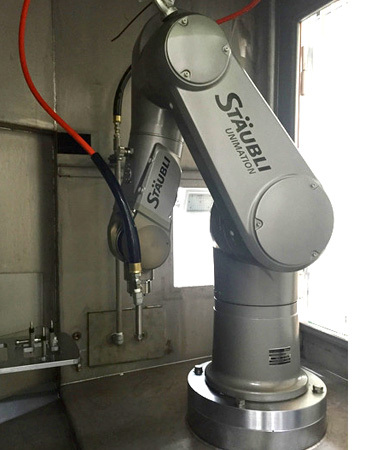 Cleaning robots make their debut At this year’s Hannover Messe, Stäubli Robotics will be demonstrating just how easy and efficient the automated cleaning of components can be. The HE cleaning robots from Stäubli are designed for particularly tough operating conditions. 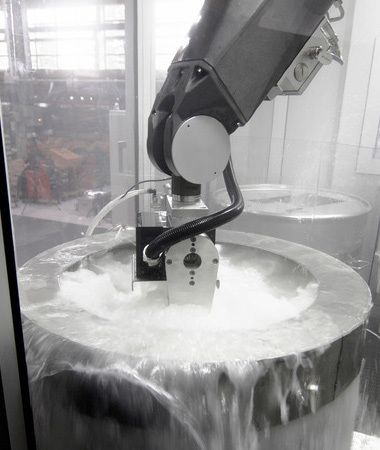 Even direct contact with liquids and splashes leaves these six-axis robots unaffected. For this purpose, Stäubli has constructed a fully functional demo cell in which the HE version of a six-axis TX90L cleans individual parts. Visitors who call in to see the demonstration can judge for themselves not only the efficiency and speed of the process but also how simple it is to program the robot. Thanks to the user friendliness of the system, it takes only minutes to program the routine for a new part. The abbreviation HE stands for “Humid Environment” and is used by Stäubli to denote six-axis robots which have been designed for use in wet rooms. The HE product line is suitable for particularly tough conditions involving liquid spray and splashing. Even the standard versions of these fully encapsulated robots comply with protection class IP65, and the application of the Stäubli overpressure unit increases this protection classification yet further. The IP67 wrist even permits submersion in liquid media and has been shown to resist acids, alkalis, corrosion and heat. Especially conducive to parts cleaning is the vertical cable ducting. All connections are located under the robot base where they are protected from splashes. To ensure the long-term sustainable deployment of its HE robots, Stäubli has used stainless steel parts, robust seals and specially coated housing parts, all of which also makes them less susceptible to mechanical damage. 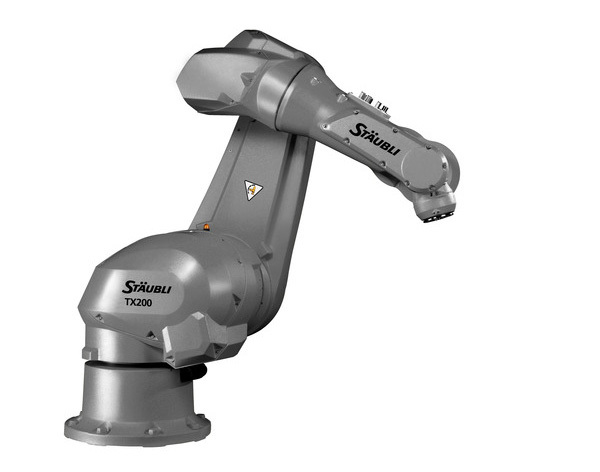 With their wash-down design, Stäubli’s HE robots are ideally suited to industrial parts cleaning. There has been a growing demand in the automotive industry for highly flexible cleaning cells, especially for the inline cleaning of individual parts such as gear boxes, turbocharger housings, crankcases, crankshafts and camshaft. Growing demand in automotive industry for highly flexible washing cells of individual parts such as gear boxes, crankcases, crankshafts etc.